Static: You specify the number of columns into which you want text to flow. Columns are always the same height, and text is allowed to overflow the final column if there’s too much of it. Dynamic: As you might expect, these columns are friendlier and more flexible, and they’re the life of any party. You can individually adjust column heights, and new columns are added automatically to accommodate the text. Selecting either column type also offers you the Column Settings dialog box, where you can specify values numerically rather than drag grips. 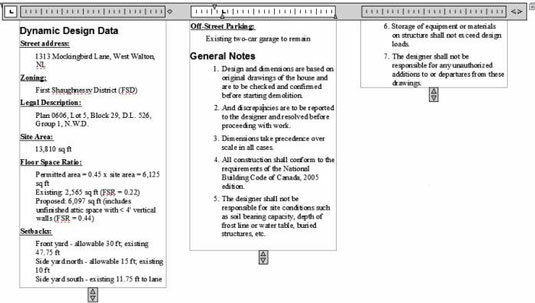 Open a drawing that contains a large, multiline text object, or create a large, multiline text object in a new drawing. If you already have drawing specifications or general notes in a word processing document, or even in a text file, you can right-click inside the mText command’s In-Place Text Editor and choose Import Text. The Select File dialog box opens, giving you the choice of Rich Text Format (RTF) or ASCII text (TXT) files. If the In-Place Text Editor isn’t already open, either double-click the text; or select it, right-click, and choose Mtext Edit. Click Columns in the Insert panel and choose either Dynamic Columns or Static Columns. If you choose Dynamic Columns, select either Auto Height or Manual Height. Selecting Manual Height puts grips on each column so that you can adjust their height individually. Auto Height displays a single grip so that the heights of all columns remain the same, but new columns are still added as required by the amount of text. If you choose Static Columns, select the number of columns you want from the menu. Clicking 2, for example, creates two columns regardless of the length of the text. You may end up with overflowing text or empty columns. Click Close Text Editor on the Ribbon (or OK on the Text Formatting toolbar) when you’re satisfied with the column arrangement. You can revert to a noncolumnar arrangement by clicking the Columns button in the Insert panel and choosing No Columns.